Publisher: Ruth Nyaboe September 13, 2017 This information is provided solely as a guideline. 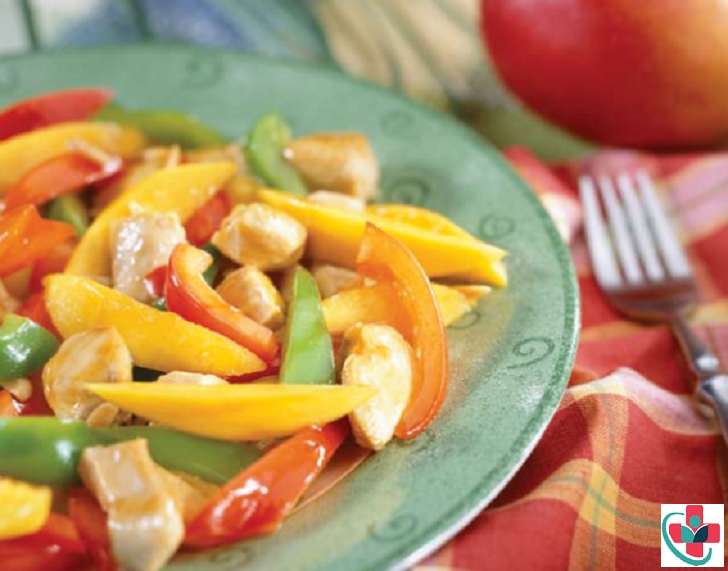 Tender chunks of the chicken team up with crisp peppers and sweet mangoes in this colorful stir-fry. Substitute half of the red bell pepper with green bell pepper for a more colorful dish. Makes 4 servings. 1½ cups per serving. Spray a large wok or skillet with nonstick cooking spray. Sauté chicken over medium-high heat until cooked through, about 10 minutes. In a small bowl, stir together pineapple juice, soy sauce, and ginger. Add sauce and bell pepper to the skillet. Cook and stir for about 5 minutes until peppers are crisp-tender. Add the mango and almonds to the wok or skillet and cook until hot. Season with ground black pepper to taste. 6. Serve each cup of stir-fry over ½ cup of brown rice.